I am honored to be writing to you once again to thank you for your ongoing support over the last twelve months. Through your generosity, the Board were able to make a grant of $2,200 to Gladstone’s Library at their Annual Meeting in March for the purchase of theological reference books and for a much-needed new printer to issue cards for the Library’s ever-increasing number of Day Readers. In January, the U.S. Friends were awarded a grant of $400,000 from the Carnegie Corporation of New York for a three-year project to digitize the Gladstone letters and annotated books held at the Library. Two new members of staff have been appointed, volunteers have been recruited and trained, scanning and IT equipment has been purchased so the digitization process is well under way. On completion, the aim of the project is to make 15,000 letters and 5,390 books freely accessible online. Also in January, work began on the refurbishment of two adjacent bedrooms and a bathroom to provide a small suite comprising a double bedroom, sitting room and private bathroom. This work was made possible through the generosity of the F.I.S.H. Foundation (NJ). Since completion of the work, the Monad Suite has proved very popular with many guests, in particular group leaders and families. In March, Peter Francis (Warden of Gladstone’s Library) and the Directors of the U.S. Friends of Gladstone’s Library hosted a reception at the Century Association in New York to celebrate the enduring global legacy of William Gladstone and to acknowledge the generous support of Vartan Gregorian and the Carnegie Corporation. Peter was also a member of a panel discussing the role of libraries and archives in the 21st century at the Church Club of New York. His fellow panellists were Ann D. Thornton, Vice Provost and University Librarian for Columbia University and Joe Lapinski, Archivist for the Parish of Trinity Church Wall Street. Visitors from the U.S. continue to play an important role in the life of the Library community: Lyn Bechtel (FL) as a course-leader, Penelope Duckworth (San José, CA), Jean Denton (Claremont, CA), Herb Lodder (Lutherville, MD) and Martha Watson (Columbia, MD) as Chaplains. The proposed visit by the U.S. Friends to Gladstone’s Library in June 2018 is now taking place from July 2 – 7, 2019. The program includes specially curated events, talks and visits which will include an opportunity to learn more about William Gladstone, see some of the treasures of the collection (not usually on public display), visit Gladstone’s study at Hawarden Castle (the private home of the Gladstone family), tour the historic attractions of Chester and Liverpool and experience some of the sacred sites of North Wales. A few places are still available. For further information and booking forms, please emailannette.lewis@gladlib.org by December 1st. Gladstone’s Library has commissioned award-winning design company, Thomas.Matthews, to produce a touring exhibition (Citizen Gladstone) which will travel to New York and Yerevan, Armenia before returning to the U.K. where it will visit a number of venues and then move to its permanent home in a new building at Gladstone’s Library. 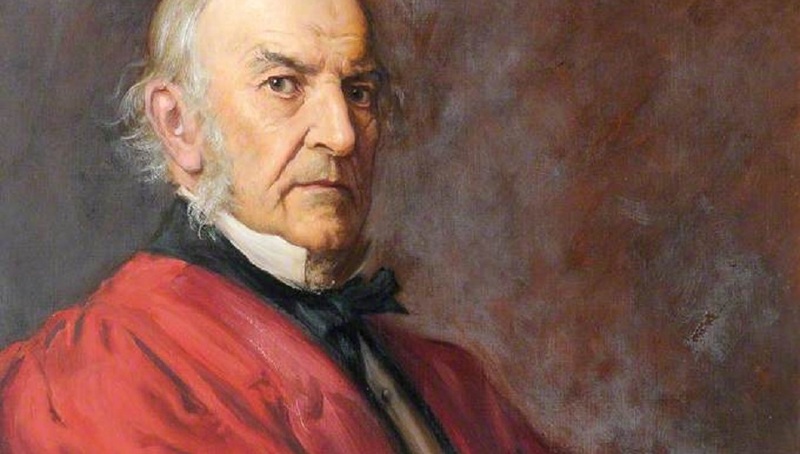 The exhibition will focus on three themes which demonstrate the resonance of Gladstone’s life and ideas for the contemporary world: Human Rights and Genocide; Evolution of Democracy; Religious Tolerance. The exhibition will be interactive and engaging, combining interpretation boards, digital content and artefacts which will be on public display for the first time. Like Gladstone himself, it will be an inspiring physical presence which will encourage debate and, we hope, drive change on many of the issues facing us in the twenty-first century. It will not present Gladstone as a remote Victorian statesman but as someone whose words and ideals remain relevant for us today. Please click here to make an online donation by credit card.